These brussels sprouts are roasted to perfection and then covered with a sweet honey mustard sauce. 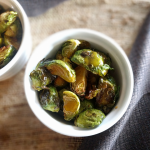 The slight bitterness of the brussels sprouts combined with the sweet mustard sauce is a beautiful and delicious combination I think you’ll really enjoy. Many people are turned off by brussels sprouts. Often it’s from being forced to eat them as a kid (without much seasoning or flavor). After you try these oven roasted brussels sprouts with the honey mustard sauce, you just might switch over to the “I love brussels sprouts” camp. We love roasted veggies in our house. 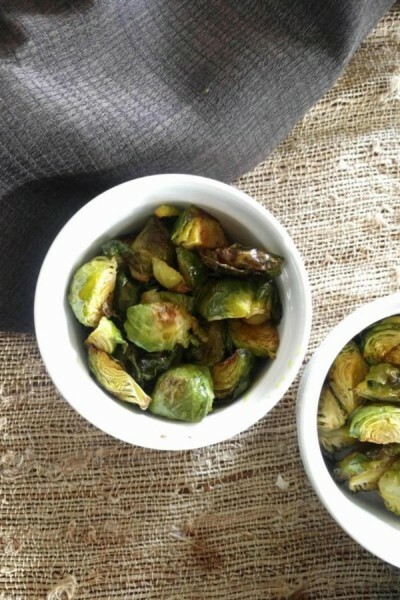 This time of year one of our favorite dishes is oven roasted brussels sprouts. Yumm! 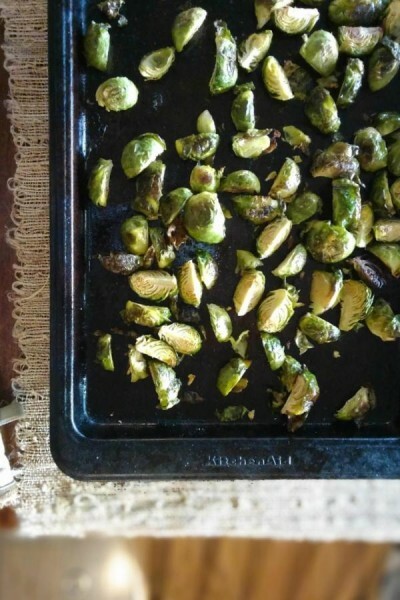 You’ll need a cookie sheet to roast the brussels sprouts. I like cutting them in half or quarters (depends on how big they are to start). You want to try to cut them to be approximately the same size so that they cook evenly. Put them on a cookie sheet so that they are in a single layer. A little space between them is ideal. I usually “toss” the veggies in oil on the cookie sheet directly. Just drizzle some oil over them, sprinkle with salt, and stir them around a little on the tray to ensure there’s oil and salt on each of them. Of course, you can toss them in a bowl with oil if you’d rather, but we don’t have a dishwasher in our house, and the fewer dishes we have to clean, the better. At 400 (F), it’ll take around 30-40 minutes for them to cook, depending on their size. I like to see a little char on them….more like medium-well done (if there’s such a thing for veggies). If you don’t like the charred look/taste, cook them until no longer crunchy. While the veggies are cooking, make the sauce. Add all the ingredients to a small mason jar (this 8 oz size works great), cover the lid, and shake until it’s mixed together. I’m a fan of tasting while I cook. So I usually drizzle a little sauce over them, then taste. If I can’t taste the sauce, it needs more. I like to be able to taste the sweet mustard sauce, but not so much that it’s overpowering. The recipe above will give you about 1/2 cup of sauce. This recipe should be enough for two cookie sheets full of brussels sprouts (about 2-3 pounds, depending on their size). And you might have a little sauce left over, depending on how much you use. Did you try this recipe? Let me know how it went in the comments below! 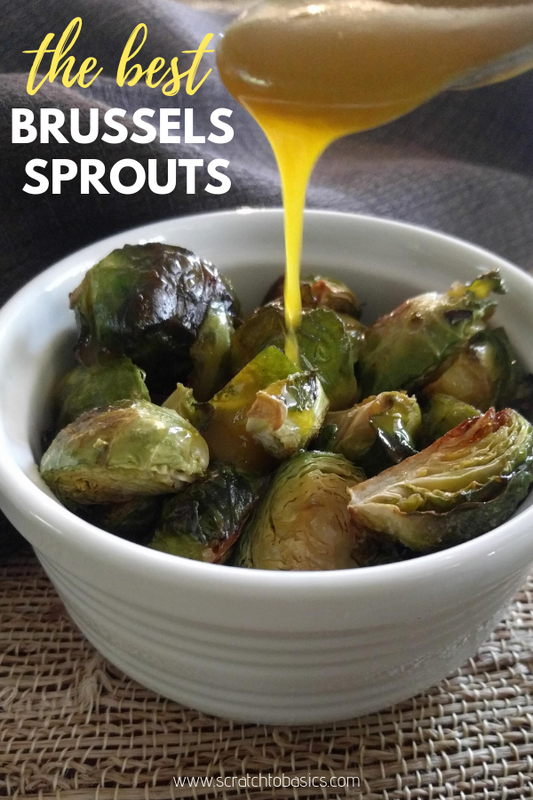 A honey mustard sauce drizzled over the oven roasted brussels sprouts makes a delicious side dish to any meal. 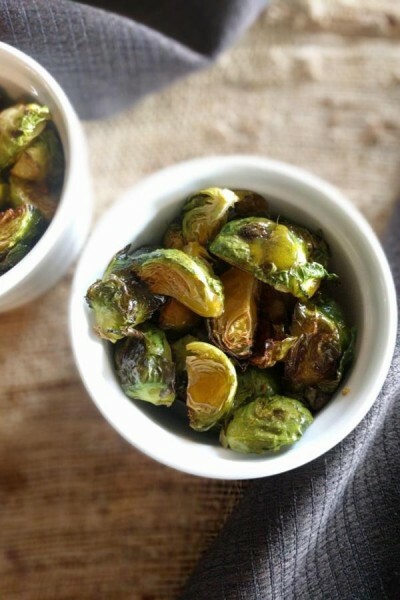 When baking the brussels sprouts, you want them in a single layer so they cook evenly.